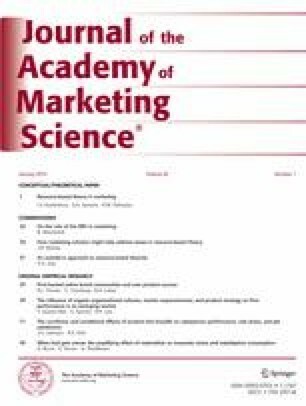 The use of resource-based theory (RBT) in marketing research has increased by more than 500% in the past decade, which suggests its importance as a framework for explaining and predicting competitive advantages and performance outcomes. This article provides a comprehensive review of RBT, including a contemporary definitional foundation for relevant terms and assumptions and a synthesis of empirical findings from marketing literature. This multidimensional analysis of RBT also evaluates extant marketing research according to four perspectives: the marketing domains that use RBT, the characteristics and uses of market-based resources that differentiate it from other research contexts, the extension of RBT to the “marketing exchange” as a unit of analysis, and the connection of RBT to related theories. This analysis also reveals some common pitfalls associated with prior research, offers tentative guidelines on how to improve the use of RBT in marketing, and suggests research directions to advance the theorization and empirical testing of RBT in the future. Badenhausen, K. (2012). Apple tops list of the world’s most powerful brands. Forbes, 10(22). Retrieved November 5, 2010 from http://www.forbes.com/sites/kurtbadenhausen/2012. Central Intelligence Agency. (2012). The World Factbook: USA. Retrieved November 18, 2012 from https://www.cia.gov/library/publications/the-world-factbook/geos/us.html.